You can now download GoPro VR Plugins for Adobe Premiere and After Effects for free, with effects including GoPro VR Reframe! These plugins can be used to frame a 360 video as a cropped non-360 video, or straighten the horizon of your 360 video. 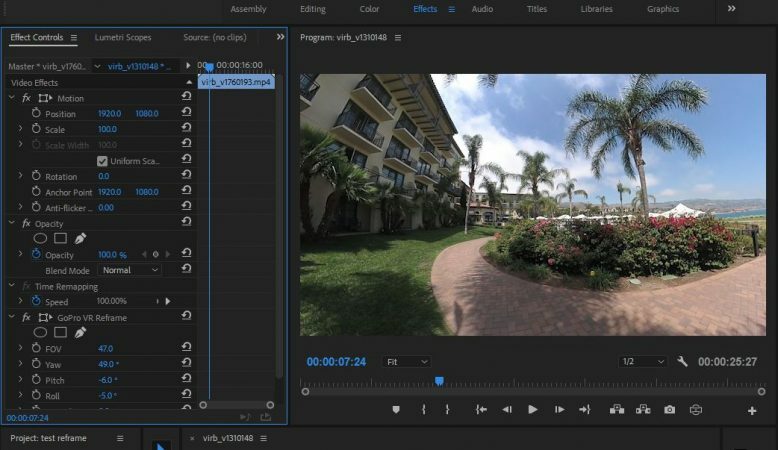 GoPro has created several plugins for 360 videos for Adobe Premiere and After Effects, including GoPro VR Plugin, which includes GoPro VR Reframe, which as of November 2018 is the only effect for Premiere to convert a 360 video as a flat, non-360 overcapture video. These plugins were previously available only if you had Kolor Autopano Video, a $749 stitching software. However, you can now download them for free. Here is the current download link for Adobe Premiere CC 2019 and After Effects CC 2019. You’ll be glad to know the GoPro VR plugin works with any 360 video, from any camera. In the sample above, I’m using it with a video from Garmin Virb 360. 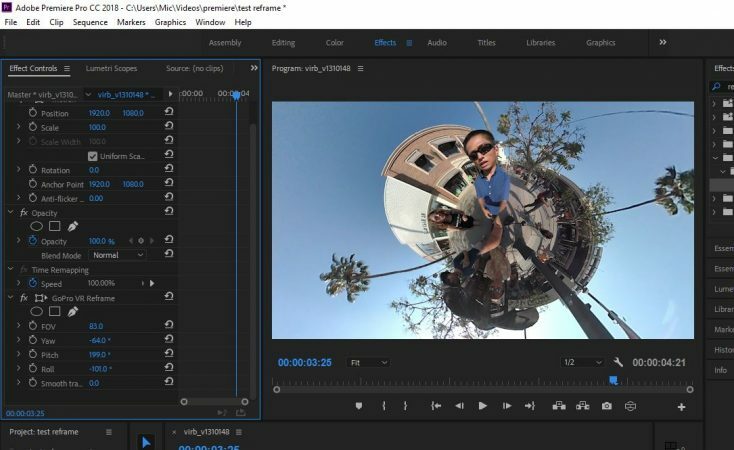 There’s another software called Insta360 Studio (tutorial here) that can also convert a 360 video into a flat, overcapture-style video. However, Insta360 Studio is limited to 4K videos. In addition, Insta360 Studio cannot create a reframed video from a 360 photo. By contrast, Premiere and VR Reframe are not limited to 4K. Moreover, VR Reframe can be applied to photos. I think the biggest issue is most 360 editing is done nowadays in Premiere. Hi Matt. I’m actually working on a tutorial for video editing with Magix. Please let me know some of the things you would like to learn so that I can include them in the tutorial. I know PowerDirector has some 360 editing features. I have only played around with it for a little bit myself but it seems to be a good alternative to Premiere for prosumers. Hey Mic, are the plugins only for Creative Cloud? Just installed the Fusion app but got no plugins (on CS6 here Premiere / After Effects). Thank you very much for posting these links Roland. FWIW you can do overcapture style videos with Insta360 Studio up to 4K. yes! thank you!!! it has been driving me nuts wanting to edit 360 clips into ‘flat’ videos. just installed the plugins (with all that gopro baggage) and fired it up in premier…success!!! Isn’t that the truth. An piece of software that’s over $800 that does stitching isn’t really accessible to the mass-market. Hi, do you have any idea why after installed gopro vr plugins or gopro vr player, the plugin does not install to adobe, and the bridge between adobe premier and gopro is not working. Looks like gopro vr player can not find adobe premier.